Look, we get it. There are Ferrari fans out there. There are Ferrari fans who have a lot of money and like to show it off, in a “please come to my unfathomably large home and see all of my rare collectibles” manner. “Exclusive” is to those people what “free food” is to the rest of us lowly common folk—irresistible. 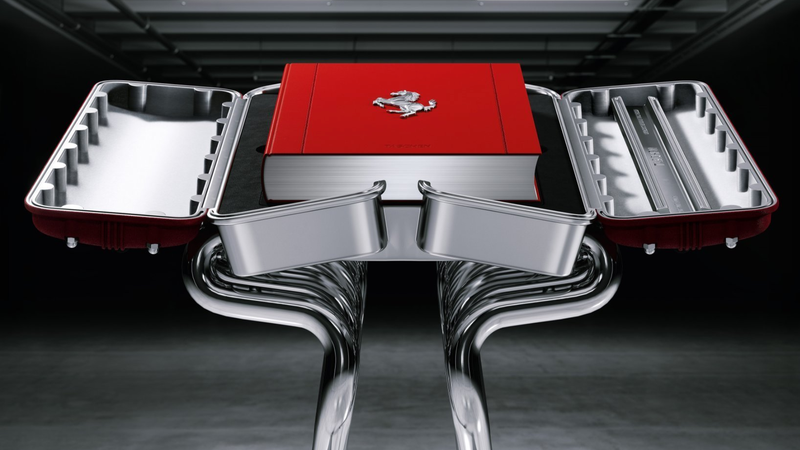 But did somebody really have to go and make a $30,000, limited-run book about Ferrari? A book that costs more than a lot of new passenger cars? Couldn’t y’all have found a better way to charge $30,000 for a big, fat brand stamp, like selling... huge Ferrari diamonds? A Ferrari-themed luxury vacation? Something? The answer is yes, someone did, and no, they obviously didn’t find a better way. Anyway, there are going to be almost 2,000 of these new Ferrari books coming in October of this year, which will include company history along with photos from the Ferrari archives and from customers. (Don’t tell anyone, but you can learn a lot about history on the internet, too, for less than $30,000.) The “read more” section on product details begins with “Few are the men and brands that have come to define a century,” so you know this book is going to be about the two best things that have ever come of this world: rich dudes and brands. The website of the publisher selling the book lists it has having two editions, with the first 250 copies being $30,000 “art editions” that come with a big, standing sculpture “evocative of the 12-cylinder engine” acting as a case. The sculpture looks kind of like a meticulously clean backyard grille held up by some forks, or some kind of pulpit in the church of the car gods. Then the publisher has a $6,000 peasan—“collector’s edition,” which comes without the pulpit part of the bookcase. Those will make up a far less exclusive run, consisting of book copies 251 through 1,947 (the year of the first official Ferrari car! That’ll be an extra $4,000 for creativity, thanks). There are many other things a person could spend $30,000 on, like a backyard hot tub, an actual vehicle, an actual two-wheeled vehicle, a downpayment on a large item or an extravagant trip. All of that applies for $6,000, too, when you think about it. But some 1,947 wealthy Ferrari fans out there will spend that cash on a book and a weird backyard-grille sculpture instead, preaching from their in-home pulpit about the rare automotive collectibles they’ve collected over the years. Maybe take a hard pass at that invitation, if it ever comes around.